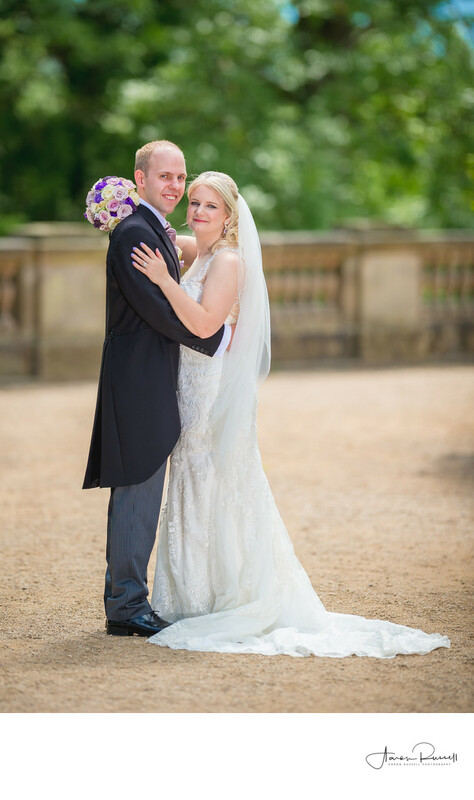 Wow, wow, wow, just love this photo I took of Laura and David at Wood Norton Hall in Worcestershire! Wood Norton Hall is a Grade II listed Victorian stately home to the north-west of Evesham, Worcestershire. It was the last home in England of Prince Philippe, Duke of Orléans, who claimed the throne of France. Used by the British Broadcasting Corporation during World War II as a station for listening to enemy radio broadcasts and an emergency broadcasting centre, it became the accommodation for the BBC's engineering training college that grew up in its grounds. The BBC retained purpose-built facilities in the grounds for technical training after selling the Hall, which became a hotel. The perfectly manicured gardens are wonderful for your formal photographs. When I took this photograph of Laura and David I wanted to capture the details in her beautiful dress and David's fine suit as well as the surrounding gardens. For this photograph, I used a long fixed prime lens that produces images that are incredibly sharp and renders colours beautifully. I underexposed the photograph to allow me to capture the background so that it didn't blow out and lose the detail. Had it done so this the image would have looked washed out and Laura's wedding dress detail would also have been lost? In order to light the newlyweds, I used my Profoto studio strobes that have an incredible amount of power that is needed when its bright midday sun. Without these strobes, you can't create such a well-balanced photograph. My profoto lighting equipment investment is in excess of £10,000 and allows me to capture truly breathtaking photographs no matter what mother nature throws at me.